As security of personal watercraft is of prime importance all the main manufacturers who import jetskis into the UK, automatically protect them with the Datatag system. This is a very sophisticated identification scheme which uses both visible registration numbers and electronic tags to protect the craft. 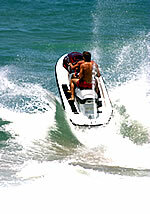 Many insurers insist on the jetski being protected and offer premium discounts for doing so.